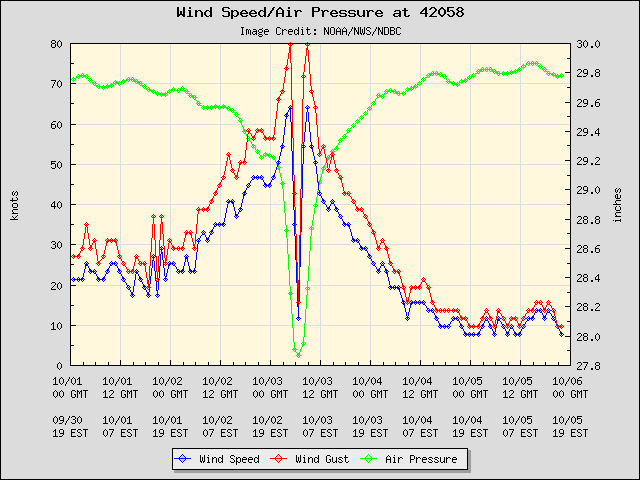 I don’t know whether you saw this post I did on my MathWorks blog, but I find the NOAA weather buoys pretty fascinating. You can look up a buoy and get all sorts of real-time data from it. It’s kind of neat for checking in on what the weather is doing in some interesting location. You can also get graphs of historical data. That’s the eye of hurricane Matthew passing over the buoy. Isn’t that cool? Can you imagine what it would have been like to be there?